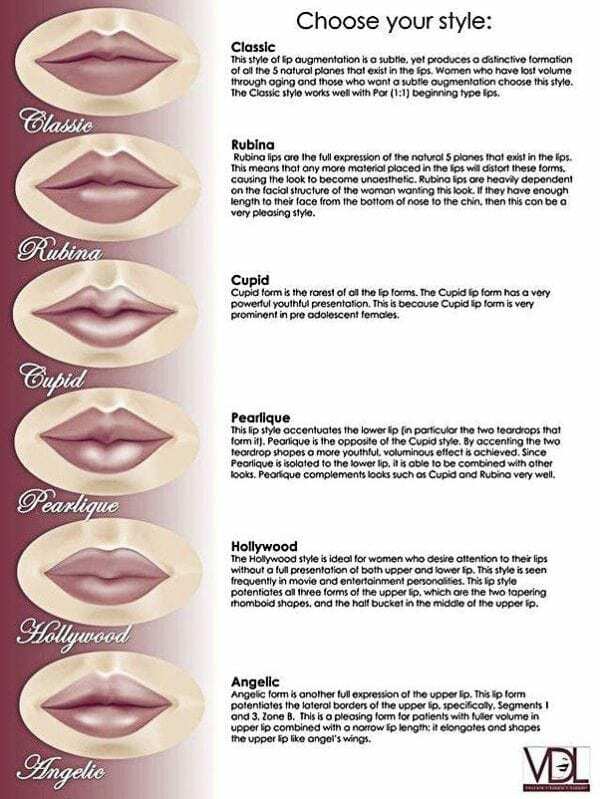 Lips are as diverse as the human face. While no two sets of lips are exactly the same, all lips have these five structural planes in common. It is the different combinations of these planes that lead to the unique appearance of each individual’s lips. The entire make of the face changes with age, genetics, and environment. The face and, in particular, the lips, are either a static or kinetic state. As cosmetic augmenters, understanding the difference between these two states is essential in planning treatment for our patients. During an examination, we must examine our patients in both a kinetic and static position. We accomplish that by asking the patient to smile and frown. A simple trick to assist you in establishing the relatively static position of a patient’s lips is to ask him or her to utter the letter “M.” The position of the lips after this consonant is spoken is considered the static position. In lips and facial fillers, it is important to focus your attention on the nasolabial as the patient smiles. 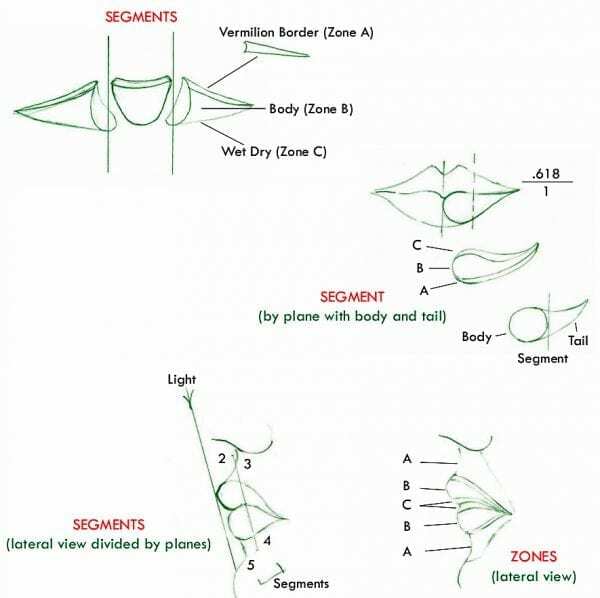 If these areas are augmented, it is imperative to consider how augmentation will affect the kinetic fold of the tissue. Augmenting the lips in a static position, without viewing the smile line and incisal appearance can lead to overfilling of the lips and produce an unpleasant appearance. There is a consensus within the scientific community on broad features of a woman’s face that are attractive to men. There are baby features that are implanted in our psyche. Having a large forehead, large, wide-set eyes, a small nose, and thick lips are all neonatal qualities. These characteristics stimulate the nurturing side in us. These are facial qualities that infants possess, and it is hypothesized that as humans, we react receptively to them. Men respond to a combination of these neonatal expressions, as well as mature, expressive features that include higher, wider cheekbones. Expressive facial features add to the perceived attractiveness, which would include a wider smile, higher eyebrows, and larger pupils. The expression of these ideas on the female face promotes a sense of availability to mate. correspond to the planes that make up the upper lip. The three parts are divided between the cone and tapered semi-bucket shape of the philtrum. The lower lips are also segmented into three parts that correspond to the planes that make up the lip. The lower lip is composed of a teardrop shape that has a ball and a tail. The segments are divided at the ball-and-tail junction. Some client comes only to inject filler in the vermillion border and cupid bow to have better-defined lips. There are three potential places fillers can go when we are injecting filling material into the lips for augmentation. Showed in the picture below, it is important to give the injector your trust to choose the best filler and best technique during the lip filler session. Therefore it is important to communicate with your injector and make sure that you have mutual goals before injection starts. Choosing your lip filer injection carefully is about 90% of the preparation that you need to do. Take your time and read reviews and ask around to get an educated decision. Juvederm Ultra Plus XC is universal and can be used almost in all facial area. Some people prefer to have a dental block before lip fillers injection, but this is an absolute method. We usually apply a special freezing cream for about 10 min before the injection, it is usually as effective as a dental block. HA fillers considered very safely and it is rarely having any serious adverse event. Expect to have some bruising after any filler session, it is usually mild and resolves after three days. We can dissolve HA fillers (Juvederm and Restylane) immediately in case of any problem or adverse effect. After discussing all potential adverse effect and before and after care protocol, we will ask you to sign a consent form. How does the injection go? Lip injections and lip fillers have no downtime. First, we apply a mixture of prilocaine or lidocaine numbing cream. Also,we might suggest dental blocking. It is important not to (distort the shape and structure of the lips. Using lidocaine with premixed HA as an add-on will help ease the pain of the filler in jection. After marking the targeted areas carefully, Dr. Kamal uses fine needle or blunt cannula to infuse the substance into the lips. The regular cost of 1 cc syringe of fillers is $600. Albany Cosmetic and Laser center in Edmonton has a special pricing and points system to help our clients get the best prices. What to expect after Juvederm treatment? The downtime varies between patients who receive lip filler injection. in General, swelling and bruising are worst after 24 hours and we ask our client avoid wearing makeup, vigorous activity, taking alcohol and sun exposure. Some notice visible changes after the procedure. Also, some see improvements after the redness reduces. Furthermore, results last between 5 months and 2 years. But, it depends on the Juvederm product. Why Choosing Juvederm for lips? Juvederm Volbella XC is ideal for people who want to add volume to thin lips. Also, it is perfect for enhancing flattened lips without surgery. Most patients prefer JUVEDERM lip fillers because it helps the lips to feel and look natural after the procedure. Assuredly, the results are immediate and last for months. What are the uses lips Fillers? In addition, the effects last for months. As a result, you may need more filler injections to maintain your lip's volume. But, all these side effects lessen within 2 to 4 weeks. If the side effects are severe, are due to inexpert handling. in other words, It includes injecting the filler injection into a blood vessel by accident. Complications may include the following: vision abnormalities, stroke, permanent scarring, or blindness. Hence, it is vital to select your physician wisely. Make certain to choose the right injector with enough experience and training in lip augmentation. What is the cost of lip fillers? The middle plane of the upper lip is semicircular and tapers toward the opening of the mouth. The lower lip has only two planes that come in shape of a teardrop that tapers toward the corner of the mouth. The experience injector target sites for lip fillers and lip injections in the right lip planes.